Hawai‘i Volcanoes National Park has announced that it will resume normal operations at 8 a.m. on Tuesday, Jan. 23, 2018, after the government shutdown that limited the park’s services. 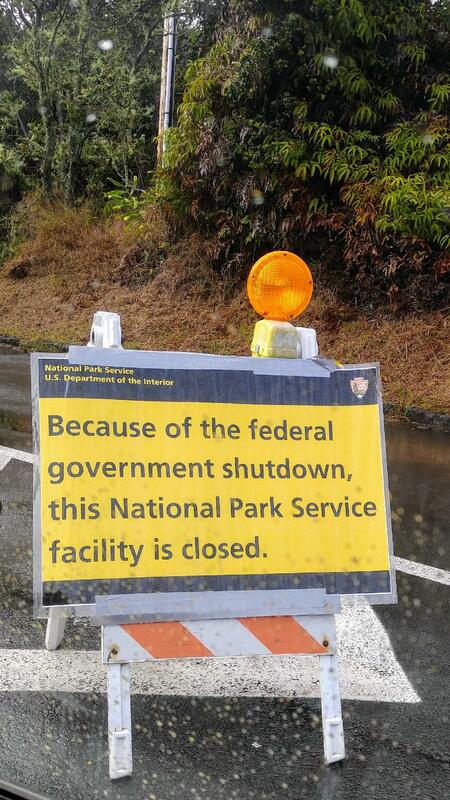 As the government shutdown continued on Monday, portions of Hawai‘i Volcanoes National Park remained closed on Jan. 22, due to public safety. Hawai‘i Volcanoes National Park announces that due to the lapse in federal appropriations and the ongoing eruption of Kīlauea Volcano both at the summit and from the Pu‘u ‘Ō‘ō vent, portions of the park are closed for visitor safety. 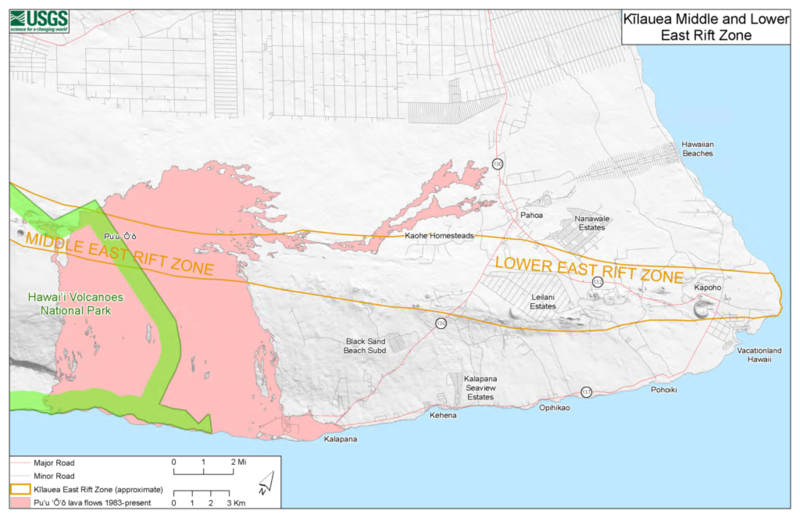 The open areas include Highway 11 through the park and Mauna Loa Road to Kīpukapuaulu (Kīpukapuaulu Trail, the day-use area and tree molds are open). Ka‘ū Desert Trail is open to the Footprints exhibit shelter. However, access may change without notice, and there are no NPS-provided services. Backcountry permits will not be issued and overnight camping will not be permitted. Photo courtesy of Scott Cate . The hazardous geologic processes and the immediate threats to visitor health and safety necessitate the restriction of access to areas that are volcanically active. These closed areas include the entire summit area of Kīlauea, Crater Rim Drive, Chain of Craters Road and the active lava flow within the park boundary. Guests at Volcano House and Kīlauea Military Camp have 48 hours to depart by Monday morning, Jan. 22, 2018. Volcano Art Center Gallery is also closed. The park reiterates that hazards associated with the active volcano pose a significant risk to the safety of visitors in the absence of National Park Service staff. Musician Will Oldham – who performs under the name Bonnie “Prince” Billy – and his wife, textile artist Elsa Hansen Oldham, have been selected as the January 2018 Artists-in-Residence at Hawai‘i Volcanoes National Park. The non-profit National Parks Arts Foundation (NPAF) announced the selection of singer/songwriter Oldham, whose music is described as an alternative blend of country, folk and punk, and his wife, whose quilting and cross stitch work puts a folksy pop-art spin on history and modern culture. Bonnie “Prince” Billy – and his wife, textile artist Elsa Hansen Oldham. Photo courtesy Christian Hansen. The pair will present a dual multimedia performance on January 26, 2018 in the Kīlauea Visitor Center at 6 p.m. Will Oldham will sing and play music while Elsa Hansen Oldham stitches on stage as her handiwork is projected on the auditorium’s movie screen. “As the park enters our fourth year of the Artist-in-Residence Program, we look forward to our second musician and first textile artist,” said Laura Carter Schuster, Chief of Cultural Resources at Hawai‘i Volcanoes National Park. “Hawai‘i has such a long tradition of both music and quilting, this pair seems like a match for our location. And the park will inspire both the musician and the fabric artist alike,” she said. The couple lives in Louisville, KY and will reside in the park for a month. Oldham has performed since 1998 as Bonnie “Prince” Billy, and prior to that as Palace Brothers and Palace Music. His songs have been performed by Johnny Cash, Marianne Faithful and others. His new record, Best Troubadour, is a collection of Merle Haggard songs. Hansen Oldham’s textile art is displayed at the Dickinson Roundell Gallery in New York, and she was recently profiled in the New York Times. The project is supported by the Friends of Hawai‘i Volcanoes National Park, and other benefactors. The NPAF is a 501c3 non-profit dedicated to the promotion of the national parks through creating dynamic opportunities for artwork based in the natural and historic heritage of America. All NPAF programs are made possible through the philanthropic support of donors. Visit www.nationalparksartsfoundation.org for details. Everyone is invited to participate in the free guided hikes, “Coffee Talks” and ‘Ike Hana No‘eau Hawaiian cultural programs in the Kahuku Unit of Hawai‘i Volcanoes National Park, from October through December 2017. Visitors can also explore Kahuku on their own on Fridays, Saturdays and Sundays, from 9 a.m. to 3 p.m. The Kahuku Unit will be open for visitors on both Christmas Eve, Dec. 24 and New Year’s Eve, Dec. 31, but no guided programs will be offered. Enter the Kahuku Unit of Hawai‘i Volcanoes National Park on the mauka (inland) side of Highway 11 near mile marker 70.5, and meet near the parking area. Sturdy footwear, water, raingear, sun protection and a snack are recommended for all hikes. Entrance and all programs are free. Participate in ‘Ike Hana No‘eau (Experience the Skillful Work) Hawaiian cultural demonstrations at Kahuku on the third Friday of each month from 10 a.m. to noon, October 20, November 17, and December 15. Programs are free. Get to know your park and your neighbors and join an informal “Coffee Talk” conversation on a wide variety of topics at Kahuku the last Friday of most months (there is no Coffee Talk in November). Ka‘ū coffee, tea and pastries will be available for purchase. Coffee Talks are offered free on October 27 and December 29 from 9:30 a.m. to 11 a.m.
Pu‘u o Lokuana is a short 0.4-mile hike to the top of the grassy cinder cone, Pu‘u o Lokuana. Learn about the formation and various uses of this hill over time and enjoy a breathtaking view of lower Ka‘ū. This hike is offered October 1 & 28 and November 5 from 9:30 a.m. to 11 a.m.
Palm Trail is a moderately difficult 2.6-mile loop traversing scenic pastures along an ancient cinder cone, with some of the best panoramic views Kahuku has to offer. Highlights include relics of the ranching era, sections of remnant native forest and amazing volcanic features from the 1868 eruptive fissures. A guided hike of Palm Trail is offered October 7 & 22, November 26, and December 3 & 23 from 9:30 a.m. to 12:30 p.m.
‘Ōhi‘a Lehua. Learn about the vital role of ‘ōhi‘a lehua in native Hawaiian forests, the many forms of the ‘ōhi‘a tree, and the new disease of Rapid ‘Ōhi‘a Death. Visitors will be able to identify the many differences of the most prominent native tree in Kahuku on this program, which is an easy, one-mile (or less) walk. The ‘Ōhi‘a Lehua program is offered October 8, November 12, and December 10 from 9:30 a.m. to 11 a.m.
Kahuku ‘Ohana Day. Families are invited for a day of fun, culture and discovery at the Kahuku Unit. Learn about the hidden powers that plants have to keep us healthy through the teachings of Aunty Ka‘ohu Monfort, a practitioner of lā‘au lapa‘au (Hawaiian herbal medicine). Collect seeds from native plants and help park rangers bring new life to Kahuku. Kids 17 and under and their families must sign up by October 13 by calling 808-985-6019. Bring water, lunch and snacks, sunscreen, hat, long pants, shoes and reusable water bottle. Kahuku ‘Ohana Day is Saturday, October 21 from 10 a.m. to 2 p.m. Birth of Kahuku. Explore the rich geologic history of Kahuku. Traverse the vast 1868 lava flow, see different volcano features and formations, and identify many parts of the Southwest Rift Zone of Mauna Loa. Learn about the Hawaiian hotspot and the creation of Kahuku. This guided easy-to-moderate hike is offered October 14, November 4, and December 9 & 30 from 9:30 a.m. to 11:30 a.m.
People and Land of Kahuku is a moderate two-mile, three-hour guided hike that loops through varied landscapes to explore the human history of Kahuku. Emerging native forests, pastures, lava fields, and other sites hold clues about ways people have lived and worked on the vast Kahuku lands – from the earliest Hawaiians, through generations of ranching families, to the current staff and volunteers of Hawai‘i Volcanoes National Park. Learn about the powerful natural forces at work here and how people have adapted to, shaped, and restored this land. The guided hike is offered October 15, November 19 and December 17 from 9:30 a.m. to 12:30 p.m. Nature & Culture: An Unseverable Relationship (He Pilina Wehena ‘Ole). Hike the Palm Trail and be inspired by a place where hulihia (catastrophic change) and kulia (restoration) can be observed as the land transitions from the 1868 lava flow and its pioneer plants, to deeper soil with more diverse and older flora. Learn about native plants and their significance in Hawaiian culture. This moderate hike is about two miles and takes two hours. The Nature & Culture program is offered October 21 and November 25 from 9:30 a.m. to 11:30 a.m. Realms and Divisions of Kahuku. Experience the sense of place that evolves at the intersection of nature and culture on this moderately difficult two-mile, two-hour guided hike on the Kahuku Unit’s newest trail, Pu‘u Kahuku. Explore the realms and divisions of the traditional Hawaiian classification system at Kahuku. Bring a snack for the “talk story” segment of this hike. Offered October 29, November 11, and December 16 from 9:30 a.m. to 11:30 a.m.
Hi‘iaka & Pele. Discover two fascinating Hawaiian goddesses, sisters Pelehonuamea (Pele) and Hi‘iaka, and the natural phenomena they represent. Visitors will experience the sisters coming alive through the epic stories depicted in the natural landscape of Kahuku on this easy 1.7-mile walk on the main road in Kahuku. The Hi‘iaka and Pele program is offered November 18 and December 2, from 9:30 a.m. to 11:30 a.m.
Keep up with Kahuku events and visit the calendar on the park website, https://www.nps.gov/havo/planyourvisit/kahuku-hikes.htm, and download the Kahuku Site Bulletin https://www.nps.gov/havo/planyourvisit/upload/2013_11_05-Kahuku-Site-Bulletin.pdf. 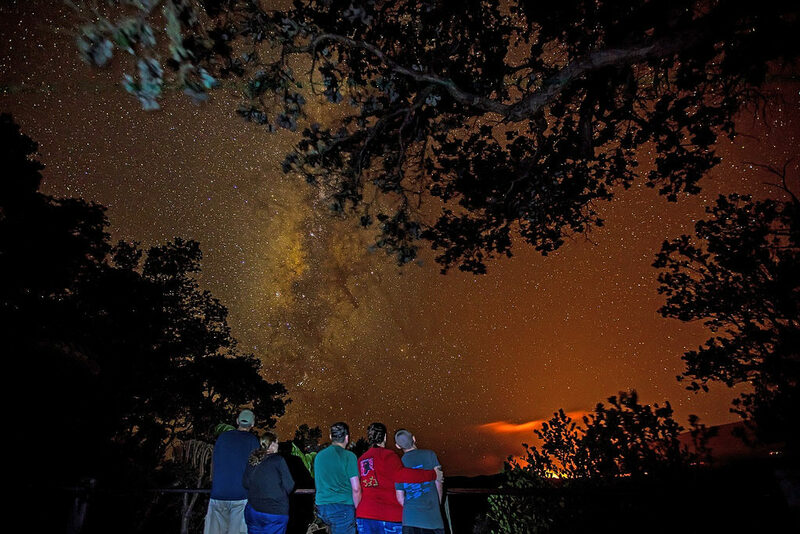 Hawai‘i Volcanoes National Park continues its tradition of sharing Hawaiian culture and After Dark in the Park (ADIP) programs with the public throughout 2017. In addition, the community is invited to lend a hand to save native rainforest through the park’s Stewardship at the Summit volunteer program. ADIP and Hawaiian cultural programs are free, but entrance fees apply. Stewardship at the Summit. Volunteers are needed to help remove invasive, non-native plant species that prevent native plants from growing in Hawai‘i Volcanoes National Park, a UNESCO World Heritage Site. Wear sturdy hiking shoes and long pants. Bring a hat, raingear, day pack, snacks and water. Gloves and tools are provided. No advance registration is required, and there is no cost to participate, but park entrance fees apply. Visit the park website for additional planning details: https://www.nps.gov/havo/planyourvisit/summit_stewardship.htm. 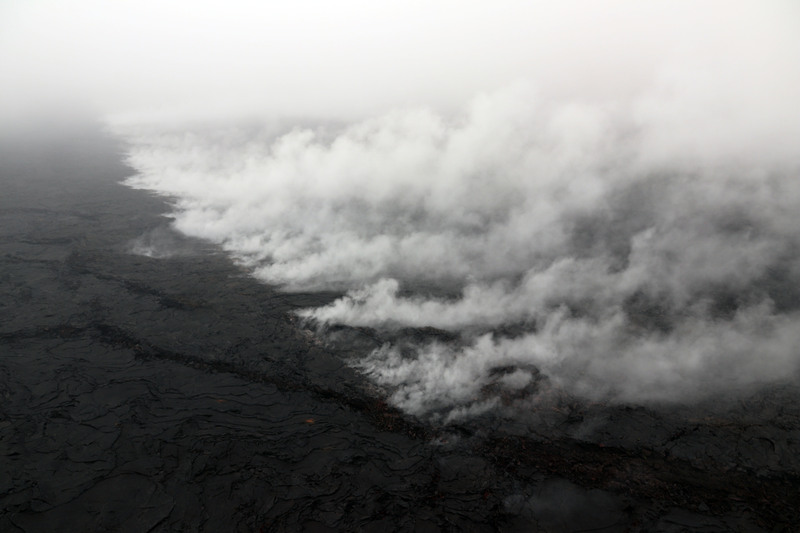 When: October 7, 13, 21, and 27 at 9 a.m.
Where: Meet project leaders Paul and Jane Field at Kīlauea Visitor Center at 8:45 a.m. on any of the above dates. Lomi. Lomi is the traditional massage practice of the Hawaiian people. There are many different styles of lomi used throughout Hawai‘i, and most are used as a way to heal body and mind. Lomi practitioner Annie Erbe will demonstrate this popular healing art. Part of Hawai‘i Volcanoes’ ‘Ike Hana No‘eau “Experience the Skillful Work” workshops. Free. When: Wed., Oct. 11 from 10 a.m. to 12 p.m.
Footprints fossilized in volcanic ash in the Ka‘ū Desert will be the subject of October’s After Dark in the Park. NPS Photo. Park Ranger Jay Robinson discusses new interpretive displays in the Ka‘ū Desert and explains what we know today about the impact of these explosive eruptions on native society. Part of Hawai‘i Volcanoes’ After Dark in the Park series. Free. When: Tues., Oct. 17 at 7 p.m.
Mark Yamanaka in Concert. Join local recording artist Mark Yamanaka for a free concert. Mark has been awarded multiple Nā Hōkū Hanohano awards since the debut of his first album, Lei Puakenikeni. His next album, Lei Maile, has also received critical acclaim. Mark’s crisp, clear falsetto and rich baritone voice will mesmerize you. Part of Hawai‘i Volcanoes’ ongoing Nā Leo Manu “Heavenly Voices” presentations. Free. When: Wed., Oct. 18 from 6:30 p.m. to 8 p.m.
Kahuku ‘Ohana Day. Families are invited for a day of fun, culture and discovery at the Kahuku Unit! Learn about the hidden powers that plants have to keep us healthy through the teachings of Aunty Ka‘ohu Monfort, a practitioner of lā‘au lapa‘au (Hawaiian herbal medicine). Collect seeds from native plants and help park rangers bring new life to Kahuku. Kids 17 and under and their families must sign up by October 13 to participate by calling 808-985-6019. Bring water, lunch and snacks, sunscreen, hat, long pants, shoes and reusable water bottle. Kahuku is located between the 70 and 71 mile markers on Highway 11. When: Sat., Oct. 21, 10 a.m. to 2 p.m. (Registration required by Oct. 13). Lau Hala. Join park staff and learn one of the great traditional arts of Hawaii, ulana lau hala. Hawaiians have used the hala (pandanus) tree to create many useful and beautiful items for centuries. Learn to weave lau hala and take home your own piece of lau hala art. Part of Hawai‘i Volcanoes’ ‘Ike Hana No‘eau “Experience the Skillful Work” workshops. Free. When: Wed., Oct. 25 from 10 a.m. to 12 p.m.
Due to escalating fire danger in Hawai‘i Volcanoes National Park, park officials have closed Hilina Pali Road from the Mauna Iki Trailhead and Mauna Loa Road at the gate past Kīpukapuaulu. Non-motorized day use such as hiking and bicycling will be permitted, and backcountry camping on Mauna Loa is allowed with a permit. In addition, ‘Āinahou Ranch access will be restricted to essential personnel and authorized vehicles only. Campfires are prohibited at Nāmakanipaio Campground and Kīpukapuaulu until further notice. The use of fuel stoves is allowed. On Thursday afternoon, a fire burned nearly three acres of seasonally dry ‘ōhi‘a woodland and scattered koa trees, forcing park officials to close Mauna Loa Road from Highway 11 and temporarily evacuate Nāmakanipaio Campground. National Park Service and County of Hawai‘i fire crews responded to the blaze, located about ¼ mile west of Kīpukapuaulu. As of 8 a.m. Friday, the fire was 50 percent contained, and its spread had been halted. No structures or homes were threatened. Park officials report that the fire was started unintentionally, and its cause is under investigation. “We’ve had an extremely hot and dry summer in the park, and across the island which escalates the risk of fire,” said Hawai‘i Volcanoes National Park Chief Ranger John Broward. “Hot components on motor vehicles have historically contributed to the increased risk of fire, and by reducing the number of vehicles, we can mitigate the potential for a catastrophic event,” he said. Portions of Thurston Lava Tube (Nāhuku) and its rainforest loop trail will be closed starting Sept. 5 for approximately two weeks while park maintenance workers replace the electrical conduit and lighting system. During the repairs, visitors will be able to explore the open section of the lava tube, which is one of the most popular destinations in the park. Visitors are advised to bring their own light source (cell phone lights are adequate). The nearby restrooms will remain open. The new energy-efficient lighting system will simultaneously increase visitor safety by illuminating the interior, and protect the cultural integrity of the ‘ana (cave) by inhibiting the growth of non-native plant species. The back portion of Nāhuku will be closed first, including the stairs leading out of the lava tube and the north section of rainforest trail. Visitors will be able to access the front section of the lava tube via the bridge entrance, and return the same way. Once work is complete in the back portion, work on the front section will start and visitors can access the rear portion of Nāhuku via the north trail and stairs. The public will be notified of any updates. The park regrets any inconvenience to the public. Thurston Lava Tube (Nāhuku) and its lush rainforest trail are popular features in the park, located near the summit of Kīlauea volcano off Crater Rim Drive. The lava tube was formed by a vigorous stream of magma that erupted from Kīlauea and crusted over about 550 years ago. When the magma source was exhausted, a long, hollow tunnel was left behind. The native rainforest surrounding Nāhuku is managed by the park as a Special Ecological Area, and is home to endemic plant, bird and insect species. Visitation is heaviest between 10 a.m. and 2 p.m., and parking is limited to 30 minutes. Fire officials at Hawai‘i Volcanoes National Park are seeking witnesses to a fire Tuesday afternoon that burned about ¼ acre of native koa and ‘ōhi‘a forest behind a cabin at Nāmakanipaio Campground. The fire started behind Cabin 3 shortly before 3 p.m., and was human-caused. A female and several children told firefighters they saw how it started, but left the scene before anyone could get her name and contact information. The fire was quickly doused with water by County of Hawai‘i Engine 19, Volcano volunteer company 19, and National Park Service resources. No structures were burned, although flames came close to Cabin 3. No closures or evacuations were required. The fire, which started behind Cabin 3 at Nāmakanipaio Campground, nearly reached the A-frame cabin. The campground and cabins are located within Hawai‘i Volcanoes National Park and are managed by Hawai‘i Volcanoes Lodge Company, LLC. NPS Photo. An investigation is underway. Witnesses and anyone with information about the fire are encouraged to call Park Dispatch at 808-985-6170. Callers may remain anonymous. “With a hot and dry summer upon us, we’re definitely at an increased risk for fire in the park, and across the island,” said Hawai‘i Volcanoes National Park Fire Management Officer Greg Funderburk. “It’s important to remember that while parts of the island might be getting rainfall, other areas are very dry and quite susceptible to fire,” he said. Sunny skies, outstanding views of Mauna Loa and Kīlauea, and an outpouring of aloha from all who participated in the Hawaiian Cultural Festival & BioBlitz, made for a joyful Saturday at Hawai‘i Volcanoes National Park. Although the official count isn’t yet available, park staff estimated that several thousand people, from keiki to kupuna, from local residents to first-time visitors, enjoyed the annual event that celebrates and perpetuates authentic Hawaiian culture. For the third year, the event connected people to science with BioBlitz field hikes. The 37th annual Cultural Festival and BioBlitz were held on the grounds of Kilauea Military Camp in the park from 10 a.m. to 3 p.m., and park entrance was free all day. The festival’s theme, Hilina‘i Puna, Kālele iā Ka‘ū, (Puna leans and reclines on Ka‘ū), celebrates the two land districts that comprise the park. The event was sponsored by Hawai‘i Pacific Parks Association, the Friends of Hawai‘i Volcanoes National Park, and Hawai‘i Volcanoes National Park. Everyone is invited to participate in the free guided hikes, “Coffee Talks” and ‘Ike Hana No‘eau Hawaiian cultural programs in the Kahuku Unit of Hawai‘i Volcanoes National Park, from July through September 2017. Visitors can also explore Kahuku on their own on Fridays, Saturdays and Sundays, from 9 a.m. to 3 p.m. Participate in ‘Ike Hana No‘eau (Experience the Skillful Work) Hawaiian cultural demonstrations at Kahuku on the third Friday of each month from 10 a.m. to noon, July 21, August 18, and September 15. Programs are free. Get to know your park and your neighbors and join an informal “Coffee Talk” conversation on a wide variety of topics at Kahuku the last Friday of the month. Ka‘ū coffee, tea and pastries will be available for purchase. Coffee Talks are offered free on July 28, August 25, and September 29 from 9:30 a.m. to 11 a.m.
Palm Trail is a moderately difficult 2.6-mile loop traversing scenic pastures along an ancient cinder cone, with some of the best panoramic views Kahuku has to offer. Highlights include relics of the ranching era, sections of remnant native forest and amazing volcanic features from the 1868 eruptive fissures. A guided hike of Palm Trail is offered July 23, August 6 and September 24 from 9:30 a.m. to 12:30 p.m.
‘Ōhi‘a Lehua. Learn about the vital role of ‘ōhi‘a lehua in native Hawaiian forests, the many forms of the ‘ōhi‘a tree, and the new disease of Rapid ‘Ōhi‘a Death. Visitors will be able to identify the many differences of the most prominent native tree in Kahuku on this program, which is an easy, one-mile (or less) walk. The ‘Ōhi‘a Lehua program is offered July 9, August 13, and September 10 from 9:30 a.m. to 11 a.m. Realms and Divisions of Kahuku. Experience the sense of place that evolves at the intersection of nature and culture on this moderately difficult two-mile, two-hour guided hike on the Kahuku Unit’s newest trail, Pu‘u Kahuku. Explore the realms and divisions of the traditional Hawaiian classification system at Kahuku. Bring a snack for the “talk story” segment of this hike. Offered July 15, August 5, and September 2 from 9:30 a.m. to 11:30 a.m.
People and Land of Kahuku is a moderate two-mile, three-hour guided hike that loops through varied landscapes to explore the human history of Kahuku. Emerging native forests, pastures, lava fields, and other sites hold clues about ways people have lived and worked on the vast Kahuku lands – from the earliest Hawaiians, through generations of ranching families, to the current staff and volunteers of Hawai‘i Volcanoes National Park. Learn about the powerful natural forces at work here and how people have adapted to, shaped, and restored this land. The guided hike is offered July 16, August 20 and September 17 from 9:30 a.m. to 12:30 p.m. Birth of Kahuku. Explore the rich geologic history of Kahuku. Traverse the vast 1868 lava flow, see different volcano features and formations, and identify many parts of the Southwest Rift Zone of Mauna Loa. Learn about the Hawaiian hotspot and the creation of Kahuku. This guided easy-to-moderate hike is offered July 22, August 12, and September 9 & 30 from 9:30 a.m. to 11:30 a.m. Nature & Culture: An Unseverable Relationship (He Pilina Wehena ‘Ole). Hike the Palm Trail and be inspired by a place where hulihia (catastrophic change) and kulia (restoration) can be observed as the land transitions from the 1868 lava flow and its pioneer plants, to deeper soil with more diverse and older flora. Learn about native plants and their significance in Hawaiian culture. This moderate hike is about two miles and takes two hours. The Nature & Culture program is offered July 29, August 27, and September 23 from 9:30 a.m. to 11:30 a.m.
Hi‘iaka & Pele. 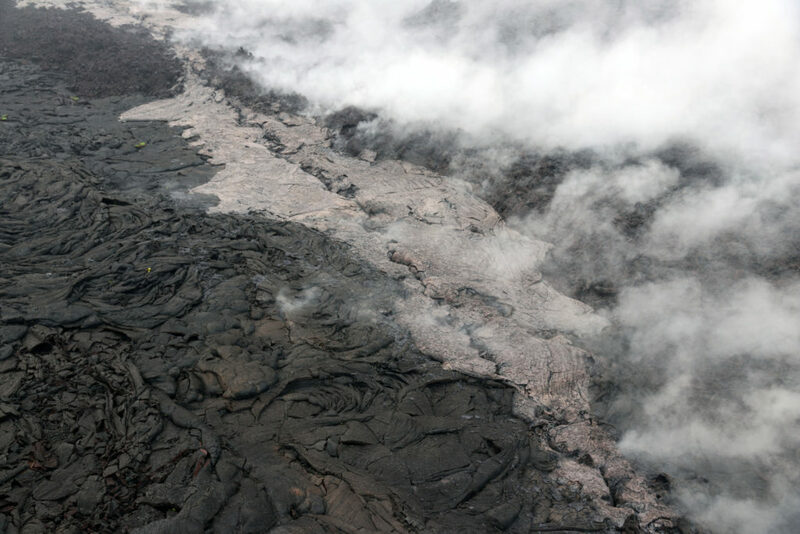 Discover two fascinating Hawaiian goddesses, sisters Pelehonuamea (Pele) and Hi‘iaka, and the natural phenomena they represent. Visitors will experience the sisters coming alive through the epic stories depicted in the natural landscape of Kahuku on this easy 1.7-mile walk on the main road in Kahuku. The Hi‘iaka and Pele program is offered July 30, August 26, and September 16 from 9:30 a.m. to 11:30 a.m.
Pu‘u o Lokuana is a short 0.4-mile hike to the top of the grassy cinder cone, Pu‘u o Lokuana. Learn about the formation and various uses of this hill over time and enjoy a breathtaking view of lower Ka‘ū. This hike is offered August 19 and September 3 from 9:30 a.m. to 11 a.m. The Pu‘u Pua‘i Overlook at Hawaii Volcanoes National Park has reopened after being closed since February to protect breeding nēnē (endangered Hawaiian geese) in the area. Hawai‘i Volcanoes National Park facilities maintenance team repairs Pu‘u Pua‘i Overlook prior to the reopening. Keiki from ages seven to 13 years old are invited to become “Next Generation Stewards” in the free summer junior ranger program through Hawai‘i Volcanoes National Park. A fun-filled, three-day program for keiki ages seven to 10 is June 6-8, and a program for youngsters ages 11 to 13 is June 13-15. Each age group begins Tuesday and ends on Thursday. For the first two days, “Next Generation Stewards” begins at 8 a.m. and ends at 3:30 p.m. On the last day (Thursday), the program begins at 11:30 a.m. and ends at 7 p.m. The programs will start and end at the Kīlauea Visitor Center lānai. The summer junior ranger program is designed to encourage a child’s enthusiasm for conservation by connecting the child with park resources and staff, and to inspire his or her appreciation of what is uniquely Hawaiian by exploring the natural and cultural heritage of Hawai‘i. Participants must bring and be able to carry their own day pack with water, snacks, lunch, and raingear, and hike for age-appropriate distances over uneven terrain at a leisurely pace. All interested applicants must submit an application to register. Contact Education Specialist Gwen “Lanakila” Anderson at (808) 985-6020 or email gwen_anderson@nps.gov for information and an application. Applications are due by noon on Wednesday, May 17, and selections will be made, and parents notified, on May 18. The summer “Next Generation Stewards” junior ranger program is co-sponsored by the Hawai‘i Pacific Parks Association and the Friends of Hawai‘i Volcanoes National Park. Park entrance fees apply. Everyone is invited to participate in the free guided hikes, “Coffee Talks” and ‘Ike Hana No‘eau Hawaiian cultural programs in the Kahuku Unit of Hawai‘i Volcanoes National Park, from April through June 2017. Visitors can also explore Kahuku on their own on Fridays, Saturdays and Sundays, from 9 a.m. to 3 p.m.
New! Join us for ‘Ike Hana No‘eau (Experience the Skillful Work) Hawaiian cultural demonstrations at Kahuku on the third Friday of each month from 10 a.m. to noon. On April 21 learn how to make tī leaf lei; on May 19, learn to make a miniature kāhili (feather standard); and come weave a small decorative fish out of niu (coconut fronds) on June 23. Programs are free. New! Get to know your park and your neighbors and join an informal “Coffee Talk” conversation on a wide variety of topics at Kahuku the last Friday of the month. Ka‘ū coffee, tea and pastries will be available for purchase. Coffee Talks are offered free on April 28, May 26, and June 30, from 9:30 a.m. to 11 a.m.
Palm Trail is a moderately difficult 2.6-mile loop traversing scenic pastures along an ancient cinder cone, with some of the best panoramic views Kahuku has to offer. Highlights include relics of the ranching era, sections of remnant native forest and amazing volcanic features from the 1868 eruptive fissures. A guided hike of Palm Trail is offered April 23, May 28, and June 25 from 9:30 a.m. to 12:30 p.m.
Pu‘u o Lokuana is a short 0.4-mile hike to the top of the grassy cinder cone, Pu‘u o Lokuana. Learn about the formation and various uses of this hill over time and enjoy a breathtaking view of lower Ka‘ū. This hike is offered May 20 and June 3 from 9:30 a.m. to 11 a.m.
Hi‘iaka & Pele. Discover two fascinating Hawaiian goddesses, sisters Pelehonuamea (Pele) and Hi‘iaka, and the natural phenomena they represent. Visitors will experience the sisters coming alive through the epic stories depicted in the natural landscape of Kahuku on this easy 1.7-mile walk on the main road in Kahuku. The Hi‘iaka and Pele program is offered April 8, May 7 and June 17 from 9:30 a.m. to 11:30 a.m.
People and Land of Kahuku is a moderate two-mile, three-hour guided hike that loops through varied landscapes to explore the human history of Kahuku. Emerging native forests, pastures, lava fields, and other sites hold clues about ways people have lived and worked on the vast Kahuku lands – from the earliest Hawaiians, through generations of ranching families, to the current staff and volunteers of Hawai‘i Volcanoes National Park. Learn about the powerful natural forces at work here and how people have adapted to, shaped, and restored this land. The guided hike is offered April 9, May 21 and June 18 from 9:30 a.m. to 12:30 p.m. Realms and Divisions of Kahuku. Experience the sense of place that evolves at the intersection of nature and culture on this moderately difficult two-mile, two-hour guided hike on the Kahuku Unit’s newest trail, Pu‘u Kahuku. Explore the realms and divisions of the traditional Hawaiian classification system at Kahuku. Bring a snack for the “talk story” segment of this hike. Offered April 15 and May 6 from 9:30 a.m. to 11:30 a.m.
‘Ōhi‘a Lehua. Learn about the vital role of ‘ōhi‘a lehua in native Hawaiian forests, the many forms of the ‘ōhi‘a tree, and the new disease of Rapid ‘Ōhi‘a Death. Visitors will be able to identify the many differences of the most prominent native tree in Kahuku on this program, which is an easy, one-mile (or less) walk. The ‘Ōhi‘a Lehua program is offered April 16, May 14 and June 11 from 9:30 a.m. to 11 a.m. Birth of Kahuku. Explore the rich geologic history of Kahuku. Traverse the vast 1868 lava flow, see different volcano features and formations, and identify many parts of the Southwest Rift Zone of Mauna Loa. Learn about the Hawaiian hotspot and the creation of Kahuku. This guided easy-to-moderate hike is offered April 22, May 27 and June 10 from 9:30 a.m. to 11:30 a.m. Nature & Culture: An Unseverable Relationship (He Pilina Wehena ‘Ole). Hike the Palm Trail and be inspired by a place where hulihia (catastrophic change) and kulia (restoration) can be observed as the land transitions from the 1868 lava flow and its pioneer plants, to deeper soil with more diverse and older flora. Learn about native plants and their significance in Hawaiian culture. This moderate hike is about two miles and takes two hours. The Nature & Culture program is offered April 29, May 13 and June 24 from 9:30 a.m. to 11:30 a.m.
Keep up with Kahuku events and visit the calendar on the park website, https://www.nps.gov/havo/planyourvisit/kahuku-hikes.htm, and download the Kahuku Site Bulletin: https://www.nps.gov/havo/planyourvisit/upload/2013_11_05-Kahuku-Site-Bulletin.pdf. A tour guide based in France and a tour group of 13 people were caught early Monday morning sneaking into the closed area at Halema‘uma‘u, the erupting summit crater of Kīlauea volcano. National Park Service law enforcement officers spotted the group just after midnight, and issued citations for violating the terms of the closure to all 14 people. The tour guide was issued additional citations for operating a non-permitted business in the park and creating a hazardous condition. All 14 were escorted out of the park. The 44-year-old male tour guide, affiliated with the French tour company Adventure et Volcans, must make a mandatory court appearance and faces a maximum penalty of $5,000 and six months in jail. His name is being withheld as the investigation continues. The violation of closure citations are $100 each, with a $30 processing fee. “This is a serious violation,” said Chief Ranger John Broward. 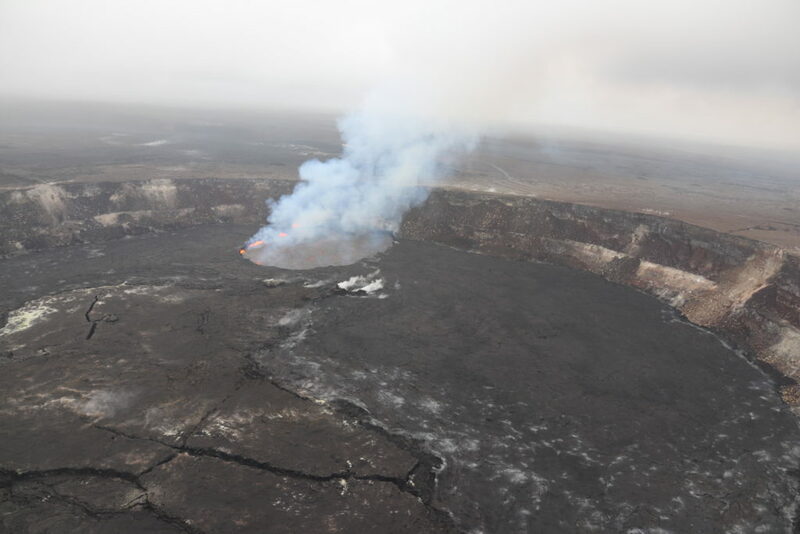 “Areas surrounding Halema‘uma‘u Crater are closed because of extremely hazardous volcanic conditions that include high concentrations of toxic gases and particulates, ongoing volcanic explosions and frequent collapses of the crater walls,” he said. Explosions from Halema‘uma‘u can occur anytime, without warning. Last August, a summit explosion hurled a layer of volcanic rock, lava bombs and molten spatter nearly 300 feet beyond the crater rim, and covered an area about 720 feet wide along the rim. It destroyed the power system of a U.S. Geological Survey instrument that was used for scientific research and monitoring volcanic activity. Last October, two explosions blasted lava spatter, rock and glassy particulates a quarter mile from the crater to the closed portion of Crater Rim Drive. In November, spatter from another lava lake explosion damaged the cable on a USGS webcam located on the rim of the crater. Halema‘uma‘u Crater, a 4.7-mile section of Crater Rim Drive, and sections of the Halema‘uma‘u and Crater Rim trails, have been closed since the most recent summit eruption began in 2008. Since July 2016, rangers have issued 35 citations for closure violations at Halema‘uma‘u, and nearly 100 citations at Kamokuna.